Every business and workplace needs the proper machines and stationery so that it can function as required. Fax machines are one of the offices must-haves. Thanks to technological advancements, fax machines have been made capable of performing several other functions as well. The best fax machine is not that easy to find. That is why we have listed the Top 10 Best fax machines in 2019 to give you an easy time. Speed: Fax speeds range between 20 seconds per page to a faster rate of 2 seconds per page. You should settle for a speed that will not derail your work. Features: Make sure you check out features such as memory and capacity. If you have a large workload or if you’ll need to retrieve documents, these features really matter. Type of fax machine: As you will see throughout the review, fax machines come in different types. You will have to choose if you want a single function one or a multi-purpose machine. The first fax machine we are going to look at is from canon. When you make this purchase, you will also get; a Power Cord, Telephone Cable, Telephone Handset, Registration Card, Starter Cartridge 128 (Starter Yield: 1,000 Pages, ISO/IEC Standard), Manuals, User Software CD-ROM and a Warranty Card. 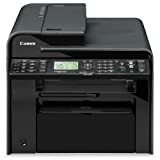 The Canon FAXPHONE L100 has a printing speed of about 19 pages per minute. The fax machine has 30 One-Touch Speed Dials and 100 coded dials. Compared to other fax machines, this one will deliver a faster print. It will only take about a maximum of 8 seconds. It also has a fax memory of 512 sheets and has an energy saver mode. In this mode, the fax’s energy consumption is quite low and will amount to about 1.4W. When in standby mode, it uses 10W. However, it will consume about 410W when it’s operational. On average, the fax will have a duty cycle of about 8000 pages per month. It has a 64mb print memory. This fax machine is powered by PrecisionCore. The Epson WF-2750 fax machine is recommended, for anyone who is looking for wireless solutions. It has Wi-Fi Direct for network-free printing and will be easy to use with your iPad, iPhone, Android tablet and other smartphones. The prints that it delivers are professional quality and fast. Its printing speeds are 13.7 ISO ppm for black and 7.3 ISO ppm for color. It is safe to say that this is the kind of machine that lets you utilize every minute of your time efficiently. Your overall paper consumption will also be lower. This is because it has automated 2 sided-printing. This is an all in one solution for most of your office needs. Your purchase comes with Four DURABrite Ultra Ink cartridges. The cartridges include are Black, Cyan, Magenta, and Yellow. The fax machine comes with a CD-ROM for product setup. You will also get a 30-page Auto Document Feeder. HP has just the thing to help enhance your productivity. This fax machine comes with automatic redial for that purpose. One thing that most users like about it is the fact that it is very easy to operate. The one-touch buttons promote its simplicity and the menus are so easy to understand. That is why accessing reports, system setups and tools will be quick. It is also very reliable and offers a fax performance of 6 seconds per page. It will cost you so little for such a performance and a crisp black output with plain paper. I would recommend this to anyone who has concerns regarding space. The fax machine has a very compact design which will help save desktop space. It blends to any environment, thanks to its dual tone styling. It can copy at up to 4 pages per minute. You will get a 3 ml black starter cartridge as well. This Panasonic fax machine is capable of receiving faxes, recording messages and answer calls. Echoes, drop-outs or clipping can be quite irritating. This Panasonic fax machine has Digital compression technology, which helps to reduce all that. The machine’s built-in memory can store up to 25 pages for transmission. The reception memory can store up to 28 pages. It is capable of enlarging up to 150/200 percent and a 92/86/72 percent reduction. One other interesting feature about it is that it has 2 line x 16 character LCD. With this LCD, operating modes, memory contents, date/time and number dialed can be indicated. I also like the fact that it is compatible with Caller ID. You will also get 50-number telephone direction and 20 broadcast locations. It has a 10-sheet auto document feeder. This fax machine offers Thermal transfer printing. HP brings you a fax machine which also has copier functions. It’s always advantageous to have machines which can perform multiple functions. This particular use HP 701 Series ink cartridges and has 200-page memory. The fax machine has several features and functions which will make work so much easier for you. Some of its capabilities are; fax polling, distinctive ring detection, remote retrieval, junk barrier, Silent mode, auto fax reduction, fax delayed sending and fax forwarding among others. The machine also comes with a telephone handset and cord. It also has loudspeaker and volume control. Canon has one of the most powerful multi-function machines available. This fax machine has speeds of up to 24 pages per minute. Its First Print Time is also one to be noted. It is one of the quickest at 5.8 seconds. Gone are the days where you constantly had to re-fill papers. This machine has a 250-sheet cassette and 35 sheet ADF plus single sheet multipurpose tray. The machine is compatible with Windows7, Windows Server 2008 R2, Windows Server 2008, Windows Vista, Windows Server 2003, Windows XP operating systems. It has a built-in Ethernet port which makes it easy for network connections. It is also energy efficient. If you have a private office or a small office, I would recommend this fax machine for you. It has a compact design and a stylish appeal to it. You will have the option of alternating between fax and telephone mode. The single line can be used to send faxes and call your clients at the same time. It is also capable of making black-and-white copies, with up to 400 x 400 dpi resolution. It can transmit at about 15 seconds per page. The fax’s 512 KB memory stores up to 25 pages. This is another great option for home offices or small offices. The fax machine has a 16MB memory, a 20-page capacity auto document feeder, and a 33.6K bps modem. You won’t find any difficulty in copying and faxing multiple pages. The machine’s paper tray capacity of 250 sheets is quite impressive for its size. For future printing capability, the fax machine was also designed with a USB interface. You can get an optional high capacity replacement toner cartridge. The machine offers up to 272 broadcasting locations. The Brother FAX4100E fax machine has transmission speeds of up to 3 second per page. If you are looking for a high-speed option, this machine is the way to go. It has a 33.6K bps superG3 fax modem which caters for the speed. That is one of the reasons why it is identified as a Business-Class Laser Fax. Its high-quality copy capabilities, high-capacity paper tray, automatic document feeder and ultra-fast fax speeds, were all designed to meet business needs capably. It can store up to 500 fax pages. The fax has a maximum monthly duty cycle of 15,000 pages. When you buy the HP LaserJet Pro, you will be getting more value than you can imagine. The machine is a combination of color laser printing, a scanner, copier, fax and wireless printing. Some features that stand out are its Wi-Fi Direct, NFC touch-to-print, 2-sided printing, 4.3-inch color touchscreen and 50-sheet auto document feeder. It will take 8.9 seconds for black and 9.8 seconds for color, during its first print out. The fax uses Original HP Toner cartridges with JetIntelligence. The toner cartridges enable up to 40% faster printing and 33% more prints. HP takes the day with its HP LaserJet Pro M477fdw. It is our top choice for the best fax machine. It is connected to up to 10 users in a workgroup. It has been designed to offer document security so that your sensitive information can remain in the right hands. The fax machine supports several paper sizes and has great print quality. It has earned its place among the top 10 best fax machines in 2019.